← Jerry vs Meg: who has the better ads? 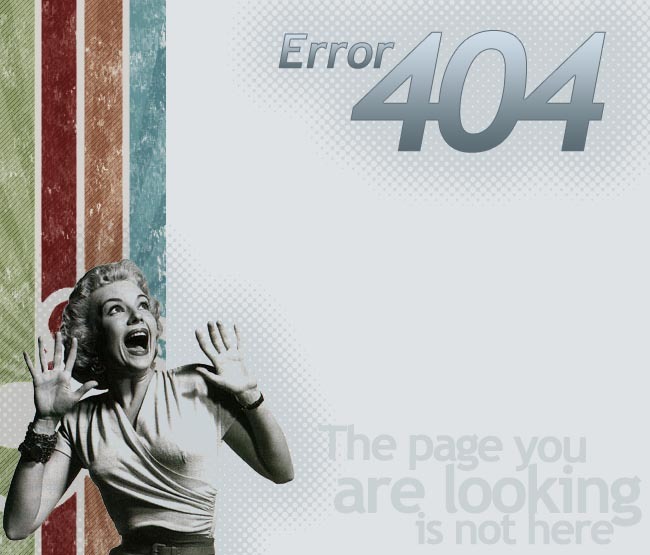 It’s sometimes easy for me to see the 404 Error Page as a metaphor for my life, especially if I’m having a bad day. It’s not a unique feeling to me, but one that is quite universal in its reach. Think about it in relation to yourself. You are just minding your own business, say, at the mall, shopping, and you have a brief encounter with a stranger who yells at you about something. Maybe you are talking on your cell phone on one of those mall benches next to them, and disturbing their peace. You know the kind of encounter I’m talking about. The random one that ends up with unpleasantries. They are quick bee-stings. In fact, a bee-sting is a great example of this very type of encounter. You’re smelling a flower in a garden and bam! A bee flies out of the bush and stings you on the nose. Your day has now taken an abrupt new course. The 404 may not be that unpleasant, but it does take you off track, and with a stark, stoic message. When I’m responsible for the management of a site, that message is a stab in the heart. “What did I do? How did I let this happen?” I feel like I’ve let my puppy off leash and now he’s lost. As a person who sees the 404 Error Page as not just a broken link, a lost page, or a website gone haywire, but as one of life’s sudden and unexpected bee stings, I was quite pleased this morning when I read this latest wonder-piece from Mashable, “34 Entertaining 404 Error Pages.” These brands and artists have turned the dreary 404 into something funny and full of color. Read, view, enjoy. My favorite is #6. That gal could so easily be me and the way I feel when life’s little bees start stinging. This entry was posted in Content Creation, Crisis Management, Design, It's Friday and tagged 404 Error Message, bee-stings, Mashable. Bookmark the permalink.